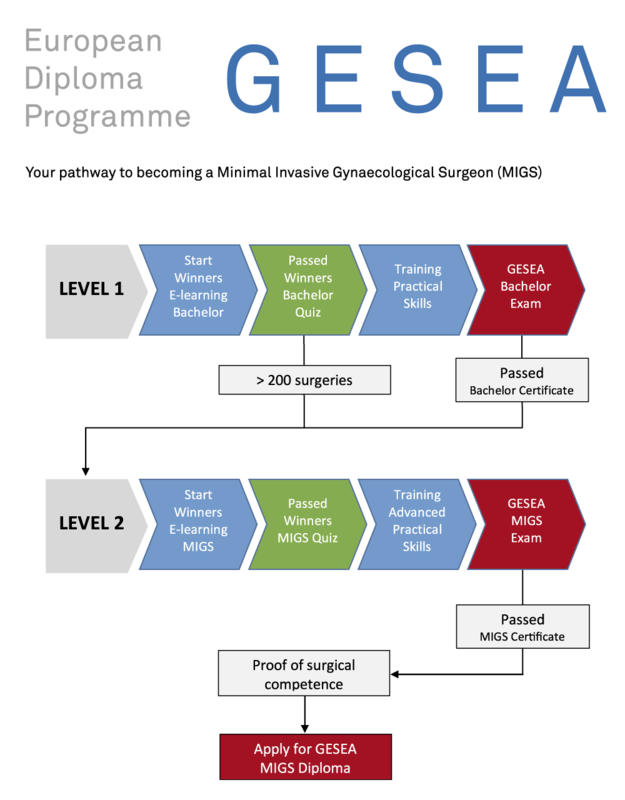 Completing the GESEA Programme allows you to acquire your Diploma of Minimal Invasive Gynaecological Surgeon (MIGS). The first step is to acquire your GESEA Bachelor Certificate proving your general endoscopic knowledge and acquirement of basic endoscopic psychomotor skills. The second step is to successfully complete the GESEA MIGS exam and be awarded the GESEA MIGS Certificate. This certificate indicates that you have mastered the knowledge and more advanced psychomotor skills as needed to start performing basic endoscopic procedures. Finally, when you have the necessary surgical experience and related competence, you may apply for the GESEA MIGS Diploma as issued by the ESGE. Get your Bachelor Certificate to get ready to start training in the Operating Room. Get your MIGS Certificate to get ready to start basic endoscopic procedures in the Operating Room. Apply for your Minimal Invasive Gynaecological Surgeon Diploma after providing the necessary proof of surgical competence. This diploma is issued by the ESGE. Subscribe to the Winners E-Learning platform and complete the theoretical tutorials and quizzes of the Bachelor level. Perform practical skill training according by using the GESEA tools during courses at the Academy, or in other GESEA Training or Diploma Centres, and during ESGE congresses or events for residents and inexperienced endoscopic surgeons. Take the GESEA Level 1 Bachelor exam at an accredited GESEA Diploma Centre. The certification session consists of (1) a theoretical exam, TESTT1, which contains 50 multiple choice questions on instrumentation, OR organisation, anatomy, different endoscopic techniques and complication management, and (2) three practical exams, LASTT, SUTT1 and HYSTT1. When applying for a level 1 certification, submit your Certificate of Completion together with your application or bring it with you at the certification session. Complete the theoretical tutorials and quizzes of the MIGS level on the Winners E-Learning platform. Take the GESEA Level 2 MIGS exam at an accredited GESEA Diploma Centre. The certification session consists of (1) a theoretical exam, TESTT2, which contains 100 multiple choice questions on instrumentation, OR organisation, anatomy, different endoscopic techniques and complication management, and (2) three practical exams, LASTT, SUTT2 and HYSTT2. First acquire the level 1 Bachelor Certificate before you can apply for the next level. Provide your certificate as proof that you have completed the first level upon registration for a second level certification session. If you have carried out more than 200 endoscopic interventions as first surgeon, you can apply for a bypass to omit the Bachelor certification. Note that the bachelor tutorials on the Winners E-Learning platform always have to be completed prior to receiving access to the MIGS tutorials. When applying for a level 2 certification, submit your Certificate of Completion together with your application or bring it with you at the certification session. To receive your MIGS Diploma, you first have to acquire the necessary surgical competence both in laparoscopy and in hysteroscopy. Download the application form to view the full list of requirements. Upon completion, this form together with all the necessary documents has to be sent by regular mail to the ESGE Central Office. Upon acceptance, the MIGS Diploma is awarded by the ESGE. You have acquired the MIGS Certificate. Minimum of 50 laparoscopic procedures in a maximum period of 5 years consisting of: Hysterectomy, Myomectomy, Urinary Incontinence, Extensive Adhesiolysis, Severe Endometriosis, and Bowel or Bladder lesions reparation. Minimum of 50 hysteroscopic procedures in a maximum period of 5 years consisting of: 10 Myomectomies, 10 Endometrial ablations, 20 Polypectomies, 10 Miscellaneous (Treatment of uterine septum, Tubal cannulation, Resection of type 1 and type 2 myoma, Major Asherman’s syndrome).